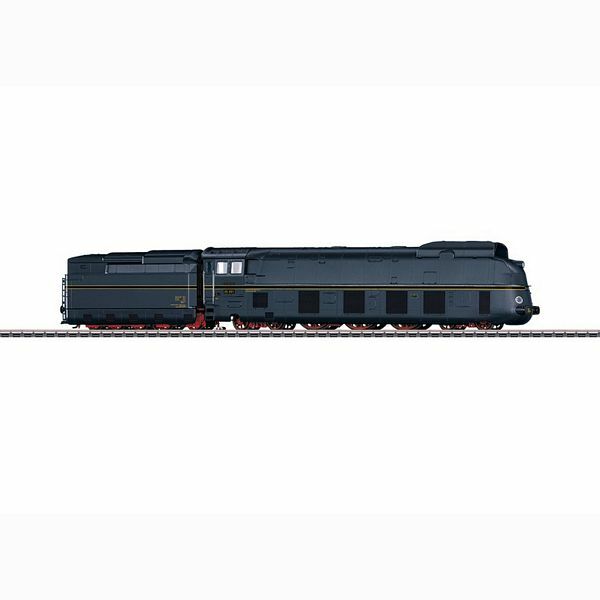 Prototype: Streamline express train locomotive Class 05 of the Deutsche Reichsbahn (DR). Version with full streamlining. Fictitious steel blue basic color with decorative stripes. Locomotive operating number 05 001. Operating condition in the late 1930s. Model: With digital decoder mfx + and extensive sound features. Regulated high-performance drive with flywheel in the boiler. 3 axles driven. Traction tires. Locomotive and tender largely made of metal. Set up for smoke set 7226. Closed side panels without additional cut-outs. Depending on the direction of travel, changing two-light peak signal and retrofittable smoke insert conventional operation, digitally switchable. Third lamp front as a counter signal separately digitally switchable. Lighting with maintenance-free warm white light-emitting diodes (LED). Fixed short coupling between loco and tender. Bow travel possible from normal radius 360 mm. Decoder accessible under retractable tender hoods. Length over buffer 30.7 cm. For speeding up to 150 km / h in both experimental and scheduled traffic, Borsig built two express locomotives in 1935 with the wheelset sequence 2'C2 'and a full line of fairing. As of March 8, 1935, the LVA Grunewald the 05 001 was available, the 05 002 followed on May 17, 1935. They blew up all previously valid standards of the unit locomotives. The driving and coupling wheels measured 2,300 mm, three cylinders provided for the drive of the second Kuppelradsatzes (outer cylinder) and the first Kuppelradsatzes (inner cylinder). The locomotives were approved for 175 km / h top speed and made about 3,400 hp. Both completed an extensive test program at the Lokomotiv Experimental Department (LVA) Grunewald, where the Edelrenner reached up to 180 km / h. On May 11, 1936, the 05 002 was on the way back from Hamburg to Berlin with a special train / measurement train and crossed the magical 200 km / h mark between Friesack and Vietznitz (route Wittenberge - Berlin). The measured value of 200.4 km / h was the world record. Subsequently, the DRG one of the two 05er on the route Hamburg - Berlin in the planning service. The Bw Altona covered from late May 1936 on schedule the Fernschnellzugpaar FD 23/24 between the Hanseatic city and the Spree metropolis with a 05, which had previously been driven by the SVT of the type "Hamburg". The 05 001 and 002 remained together with the later added 05 003 after the war in the West and were examined in 1950/51 at Krauss -Maffei main. The 05 001 and 002 lost their power shell. They found a new home at the Bw Hamm with a three-day roster and had from 1951 the longest run between Hamburg and Cologne with 478 km. Starting in 1953, they even ran at short notice for a year between Hamburg and Frankfurt (Main) a whopping 703 km. At this time, the machines also delivered their peak performance. In the summer of 1955, the machines shone in the F-train service with the F 1/2 "Hanseat", the F 13/14 "Dompfeil" and the F 16 "Sachsenross". But eight years later, the machines had served as a splitter genus. The 05 001 was spared the way to the junkyard. She was again equipped with a half-sided streamlining and brought to the Nuremberg Transport Museum.